he historic city of York was voted Best European City and the UK’s Best City in two recent polls. As one of England’s finest and most beautiful cities, York’s countless world-class attractions (Minster, Roman and Viking heritage, medieval and Georgian architecture, museums and galleries, to name but a few) have always attracted tourists from around the world. More recently, the riverside city has also become a fashionable and cultural hot spot, with a year round calendar of festivals and events, smart shops and restaurants, great hotels and luxury spas adding to its appeal. Middlethorpe Hall is an antiques-filled country house hotel standing in 20 acres of gardens and parkland on the city’s outskirts. 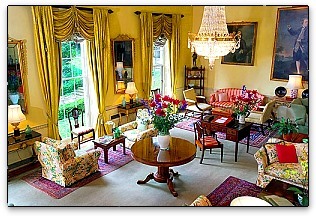 Originally built in 1699, it has been beautifully restored and offers an ideal setting in which to unwind. The elegant lounges and oak panelled dining rooms have fireplaces and cozy log fires, while up the thickly carpeted (and appropriately creaky stairs), the comfortable and spacious rooms are individually furnished and decorated. When we stayed at the end of last year, our room was in the attractively restored 18th century courtyard adjoining the main building. You can wander through the hotel’s extensive gardens, try your hand at croquet on the lawn or relax in the delightful Health and Fitness Spa. The bijou spa is a concession to the 21st century, where a spa facility is de rigueur even in historic gems like Middlethorpe Hall. The spa has been created in a subtly extended pair of Edwardian cottages opposite the hotel, and other than the word SPA on one of the two doors, there is absolutely no hint of the transformation within. The surprisingly spacious interior includes a reception area, changing rooms, a large swimming pool, hot tub, steam room and sauna, gym and a refreshment area. Upstairs are three cozy and contemporary beauty rooms providing the latest treatments from Clarins, Molton Brown and ESPA. You can have a single treatment or a day or half day program, and if you can’t decide how you want to be pampered, friendly therapists are on hand to offer help and advice. My soothing Decléor facial, left me feeling totally relaxed and my skin brighter and softer. Just what I needed to ease the stress of a busy week and to look my best for a special evening of ballet at the Grand Opera House. No visit to York is complete without some shopping. The York Designer Outlet is just a ten minute drive from Middlethorpe Hall, while the compact city centre is a shoppers’ paradise, with many unique shops and big name stores all within easy walking distance of each other. The York Visitor Information Centre’s free shopping guide Five Routes to Shopping Heaven, will point you in the right direction, with useful maps and special discounts, whether you are shopping for antiques, jewelry, designer fashions, homewares or just want to browse the quaint medieval streets and narrow passageways. Spa lovers will find many excellent day spas and beauty salons in the city. Take a break from the shopping or sightseeing and indulge in a relaxing treatment or two at the Alquimia Spa. York’s renowned day spa has been voted one of the top ten day spas in Britain by Condé Nast Traveller and was Day Spa of the Year in 2003 and 2004. 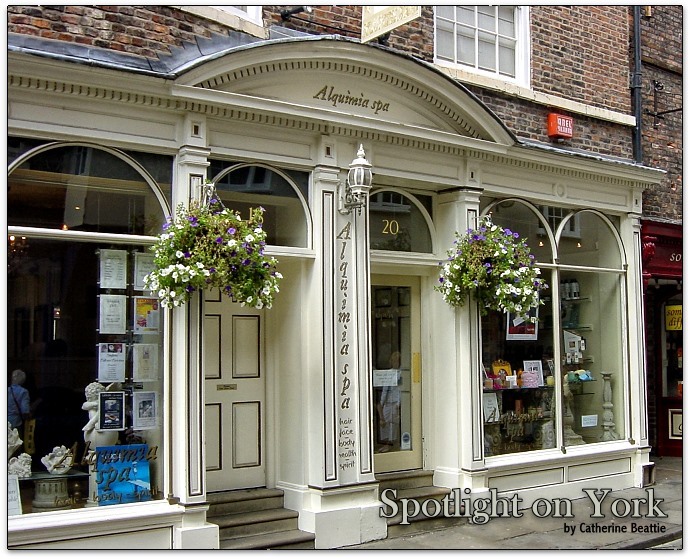 It is a restful oasis located in the heart of the city on historic Stonegate, a short walk from the Minster. Inside, amid sumptuous period surroundings, professional therapists work ‘from the heart’ by incorporating healing energy into all their treatments for a truly therapeutic and individual experience. Alquimia’s luxurious range of bespoke treatment use natural products formulated in the heart of the Spanish Pyrenees to ancient alchemic recipes. The medicinal plants, flowers and herbs used in Alquimia treatments are harvested at precisely the right astrological moment so as to capture their vital force and give maximum therapeutic benefit to the client. The extensive choice of treatments ranges from facials and dead sea mudpacks to kinesiology, therapeutic massage and spa body treatments. Physiotherapy, reflexology and aromatherapy are also available as are yoga and Pilates classes. You can book a single treatment or a day or half day package. Come on your own, with a friend or partner - there is a good choice of men’s grooming and spa treatments as well as a full hairdressing salon on site. As I had time for only a single treatment, I opted for the Healthy Feet Pedicure. At £50, a bit pricy perhaps, but 90 minutes of sheer bliss and the benefical effects lasted weeks. I emerged with my feet buffed and polished to perfection, ready for a different type of therapy – retail therapy. York is TWO hours by rail from London’ King Cross, Edinburgh and Manchester. Visit National Express East Coast (www.nationalexpress.com) for special offers and timetables. By road, York is just 20 minutes from the M1/M62 motorway network. 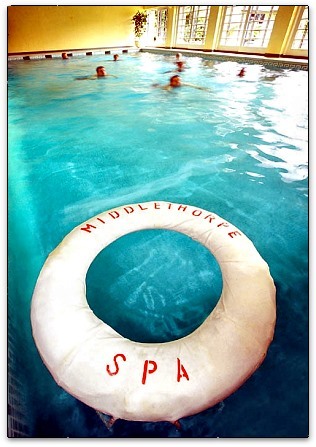 www.middlethorpe.com, from £154 including dinner in the Oakroom, early morning tea and continental breakfast, one Decléor spa treatment and use of the spa. 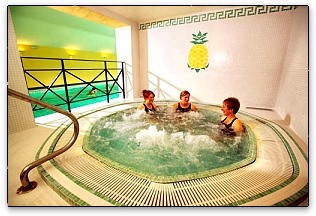 www.alquimiaspa.com, three-hour spa packages from £125, Hot Stone Therapy from £40. staylonger@york-tourism.co.uk. ‘Stay Longer’ guests can also buy a three-day York Pass for £27 (the price of a two-day pass) which gives free access to most major tourist attractions. Catherine Beattie is a UK-based health and travel writer/publisher with a lifelong interest in spas. Her credentials include writing and publishing several consumer guides including Healthy Breaks in Britain & Ireland (the UK's first spa guide) and The Really Useful Guides. Catherine was founding editor of Spa Health & Beauty magazine and contributes to many UK national newspapers and magazines including The Sunday Times, The Express, Here's Health and Harpers & Queen. She is a member of the British Guild of Travel Writers, Guild of Health Writers and Spa Business Association.